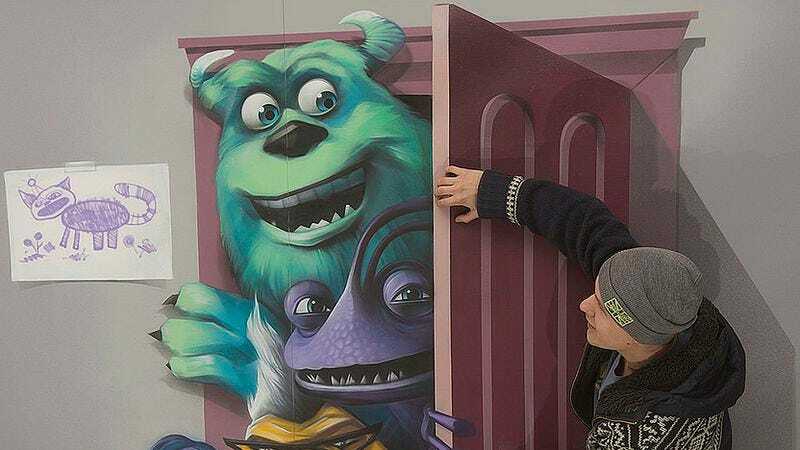 Russian art studio Brain Mash has created a gorgeous series of faux-3-D paintings featuring original characters and pop culture icons like the cast of Monsters, Inc. and Slimer from Ghostbusters. Utilizing smart perspectives and clever shading, the images in 3-D Exhibition trick the eye, giving the impression that the gallery goers are really busting ghosts, or feeding a bone to a giant, bounding pug. They’re beautiful, and the use of beloved kids’ characters like Mike and Sully reinforces the nostalgic fantasy of opening a door and having lifelike cartoons come spilling out. You can see the rest of the series on Brain Mash’s tumblr.